I’ve seen dozens of ballets in 2014 but zero Broadway shows. After tiring of Nutcracker, I jumped at the chance to see On the Town at the Lyric Theatre given its ties to the ballet world-Jerome Robbins was the original choreographer and the current production features NYCB’s Megan Fairchild. The production is a great revival, a rousing work with never a dull moment for 2 hours and 35 minutes. The critic in me wants to find a few shortcomings with the production-but I can’t find any. It’s a helluva show in a helluva town. The musical is based on Robbins’ idea for his 1944 debut smash hit ballet Fancy Free with book and lyrics by Betty Comden and Adolph Green and music by Leonard Bernstein. The original 1944 Broadway production ran for 13 months followed by a 1949 film with Gene Kelly and Frank Sinatra. Broadway revivals in 1971 and 1998 were unsuccessful, closing after only several months. The plot of On the Town follows a rather predictable path about three sailors in New York on 24 hour leave with two goals: seeing the sights (Bronx Zoo at 10:30, Stature of Liberty at 10:40) and pursuing beautiful women (Fancy Free was about three sailors competing for the attention of two women). However, with the great choreography and performances, the show seems fresh 70 years since its debut. The show nicely captures the tempo of New York-from the hustle and bustle of the subways to the loneliness of being alone in a city of eight million people (Lonely Town). 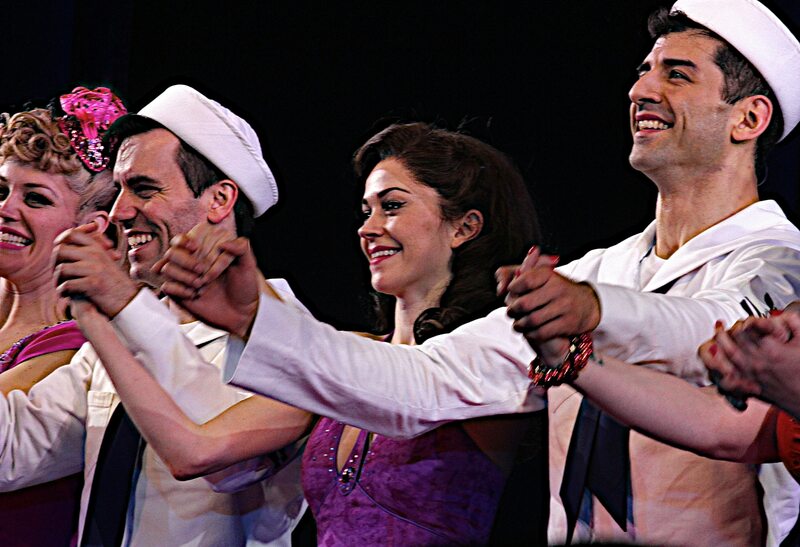 Emmy winner and Smash choreographer, Joshua Bergasse choreographed this production in the spirit of Robbins. Bergasse has a lot to work with as the cast is filled with talent, starting with NYCB Principal Dancer Megan Fairchild as Ivy and Tony Yazbeck as Gabby. Megan’s dancing capabilities are well documented and on display with energetic fouettés and supported leaps over the sailor’s heads in Presentation of Miss Turnstiles; Tony and the two other sailors Jay Armstrong Johnson and Clyde Alves are sure footed in the dance segments, with lots of jazz turns, jetes, and jazz style leaps, all performed with abundant energy and attitude. Megan and Tony have a nice pas de deux (Pas de Deux) in Act II in his strange dream sequence in which they dance in a boxing ring, followed by a sensual and elegant duet. We all know Megan can dance, but can she act and sing? She’s very effective as the sweet Ivy, who Gabby pursues after seeing her on a poster in the subway for a Miss Turnstiles competition. Megan has great comedic timing and can sing well, appearing in Presentation of Miss Turnstiles, Do-Do-Re-Do with her voice teacher Madame Dilly, who is more interested in alcohol than teaching (the hilarious Jackie Hoffman), and Pas de Deux with Gabby. We find out that Megan can sing effectively while standing on her head and in penché position during Do-Do-Re-Do. In addition to Gabby’s pursuit, hot-to-trot Hildy (Alysha Umphress) pursues Chip (Jay Armstrong Johnson) as soon as she picks him up in her yellow cab. Alysha shines in I Can Cook Too. In the meantime, Ozzie (Clyde Alves) discovers anthropologist Claire (Elizabeth Stanley) amid the dinosaurs at The Museum of Natural History as she attempts to escape her pending marriage to a distinguished judge. It’s a Darwinian dream as prehistoric men come to life as they sing and dance during Carried Away. As the two sailors are pursued, Gabby is in hot pursuit of Miss Turnstiles. The show features colorful, cartoonish sets by Beowulf Boritt and costumes designed by Jess Goldstein. The 28-piece orchestra is under the direction of James Moore, who has his baton chomped off by a Museum of Natural History dinosaur. The orchestra was loud and brassy, starting from the opening Star Spangled Banner, as in the original production during the war years 1944-1945. The production has several segments where the performers march up and down the aisles, performing some segments in the audience. During one number, a performer was singing several feet away from me in the aisle, an experience I haven’t had before. John Rando, whose previous Broadway credits include Urinetown and The Wedding Singer, is the director.